Betfred Messenger – Get started with a £30 free bet! Betfred Messenger is a brand new and unique way to bet. You’ll notice straight away it looks more like the messaging or chat apps you have on your phone, and that’s exactly why it’s so quick and easy to use. If you want to give it a try then you can get started today with a free £30 bet. The next section explains how you can do this, and the rest of this review page discusses the benefits of the app. 4. Sign into your Betfred account through the Betfred Messenger app and check the settings to get it ready to use. It only takes a moment and you’ll be ready to place your first Messenger bet. The team at Betfred will receive the request and quickly reply with a bet placement confirmation. And that’s it, your bet is placed! This completely removes the need to navigate either the website or the mobile app, you can just think of your bet and write it to the bookie – much like you would do in a betting shop! This is a great use of technology that allows people to bet quickly and efficiently, just like they would have done in years gone by. And in fact, just like you still can in one of the many Betfred betting shops. 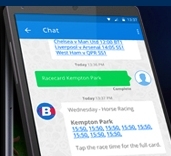 The Betfred Messenger app is also fully integrated with your existing Betfred account. This means you can access your account, make deposits and withdrawals etc, all the things you can do normally via PC, tablet or mobile, it’s all there. What else does Betfred Messenger do? Another great reason to use the app is that you can set it up to give you news, alerts and results on your favourite sports. This is done via the “Favourites” section, where you might like to set it up to give you score updates, team line ups and latest odds on all your preferred matches. This is all possible because the team at Betfred is on the other end of the chat and can respond to you in no time at all. Give it a try, it’s a great new way to bet! With the new season approaching, it’s a good time to give it a go.